X-ray has come a long way since its discovery in 1895. Originally used in the medical field, X-ray technology has been integrated into many industrial sectors including the electronic assembly industry. Dr. David Bernard is an expert in X-ray technology within the electronics industry. Dr. Bernard and I discuss the modern use of X-ray technology, applications within the electronic assembly industry and the skills required to interpret the images produced. 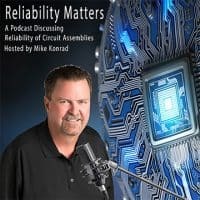 A podcast discussing the reliability of circuit assemblies.